Welcome to Fish Window Cleaning! We are your local window cleaning company serving Visalia, Kingsburg, Tulare, Porterville, Lemoore, Delano, and Wasco, CA. Contact us today for a free on-site estimate! We are genuinely pleased to offer the most professional and consistent service in the industry to our clients. Our cleaners have the pride of ownership, and that pride reflects in our work. Every time. Day in and day out. Wouldn't it be great to never have to worry about how your windows look again? We can make your windows sparkle all year long! 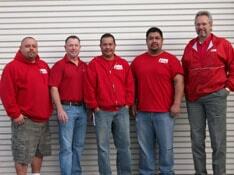 We are your local window cleaners and we are ready to make your home beautiful. We can clean all of the windows in your home regardless of how hard they are to reach. We can also clean out your gutters, make your mirrors shine, and even polish your chandelier. We wear clean shoe covers while in your home and use environmentally friendly cleaning products so you and your family are not subjected to harsh fumes. Our team is licensed, bonded, and insured and has been extensively trained to provide the highest quality service possible. We are committed to your satisfaction, and are sure you'll love our work! As the nation's largest window cleaning company, we understand the needs of businesses. We know that first impressions count and that's why we strive to give your customers a great first impression with beautifully clean windows that will impress them. We know that needs differ from business to business and that's why we tailor our cleaning programs to meet your specific needs, budget, and schedule. We know that our appearance reflects on your business and that's why we wear uniforms and hire background checked employees. When you choose Fish Window Cleaning to maintain the appearance of your business, we are committed to your satisfaction! If something isn't right, we'll make it right! Contact us today for your free on-site estimate! We would be happy to add you to our growing list of satisfied customers!